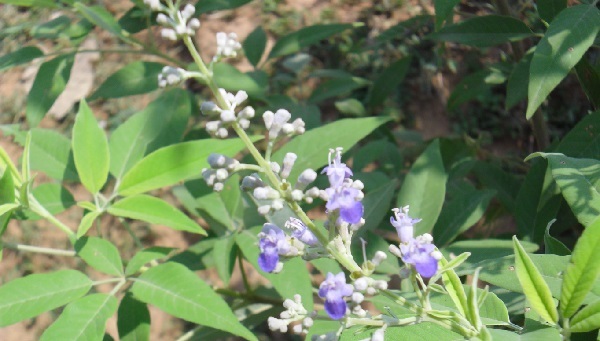 Uses of Vitex negundo L.
Home / Uses of Vitex negundo L.
Leaf smoke is inhaled to get rid of cough14; in case of diarrhoea flowers are used69; extract of the plant is taken as a diuretic14. ‘Muscle & joint rub’11, is a highly effective medicine for backache, muscular sprain and joint pain. ‘Dental Cream’11 is a formulated toothpaste that tightens and reduces swelling of gums, stops gum bleeding, prevents toothache, decay and controls bad breath. ‘Atharva Nirgundi Siddha Tail’134 is useful in arthritis, joint pain, relieves oedema. Thirty-five patents were found on its medicinal applications mainly for rheumatic arthritis135. Biologically synthesized green silver nano-particles from leaf extract of Vitex negundo L. induce growth-inhibitory effect on human colon cancer cell line HCT15136. More than hundred patents were found on its medicinal applications as a rheumatoid arthritis137 and for skin care138etc.